LENDonate supports a robust marketplace of pre-qualified nonprofit borrowers. Lenders tailor offers that combine donations and loans at market or below-market interest rates. After the bidding period completes, we identify the most advantageous package of offers for the borrower - with a priority to the most generous offers. We are committed to responsibly servicing the loans so borrowers can get to work on their projects and lenders receive the repayments they are counting on. If you’re a nonprofit, you’ll start by identifying your needs and applying for a loan. LENDonate vets and verifies each borrower. Through LENDonate’s online platform, lenders will discover borrowers, learn more, and find their perfect match. When a loan is finalized, documents will be issued, the money will go to the nonprofit, and a schedule for repayment will begin. 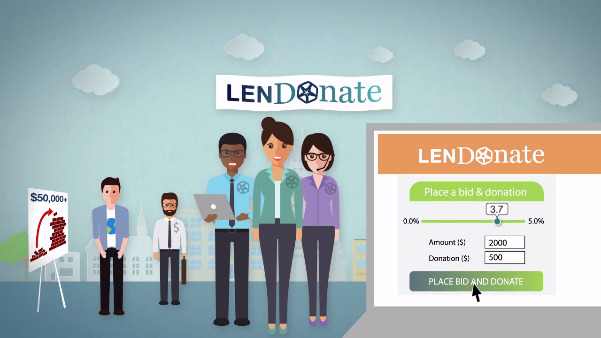 LENDonate is a one of a kind marketplace lending platform where nonprofits can showcase their programs and efficiently receive the capital they need to reach their next milestone. Feature your project — with a $50,000 minimum — and we will bring our lenders and donors together with yours. Leverage your connections and create new ones to get funded in just a few weeks. We started LENDonate because we believe in the power of communities. Our marketplace lending platform fosters relationships between lenders and nonprofits to launch projects that transform people’s lives. This isn’t just another financial investment opportunity — it’s a mutually-beneficial way to create impact for the greater good.